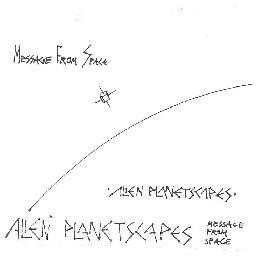 Alien Planetscapes - "Message From Space" / "Radio Special Volume VIII"
Doug "Dr Synth" Walker is finally starting to reissue music from the enormous Alien Planetscapes cassette catalog on CDR. A year or so ago he tried to do this, and reviews even appeared in Aural Innovations, but this time the discs are ready. And for his first two releases Doug has chosen one from the electronic space duo days and one from the AP "big band" days. So with these two sets we've got representations of the very different sides of Alien Planetscapes, each being equally critical in the band's history. In fact, in the past couple years I've had the opportunity to hear both sides of the Alien Planetscapes experience live. I've heard the hot rockin' full band AP at the Strange Daze festivals and then this past Summer heard the duo electronic AP at Quarkstock. Message From Space is one of the many electronic duo projects Doug recorded, this time with David Prescott. Prescott plays synthesizers, sequencer, guitar, keyboards, and effects, and Doug plays synthesizers, sequencer, organs, keyboards, guitar, flute, and effects. Recorded in July 1985, each CD consists of single extended tracks: "First Encounter", and "Second Encounter". This is electronic space music at its very best. It's what Tangerine Dream sadly stopped doing long ago. The music moves along at a rapid pace most of the time, both musicians busily contributing multiple textures and sounds to the mix. The atmosphere is culled from the darkest regions of space and imagery conjured up in this listener's mind is that of a massive battle in space. Headphones are absolutely required to properly absorb all the separate synth and keyboard bits weaving themselves amongst each other. Unlike a lot of lengthy electronic pieces, which either develop very little or very subtly, this music is continually evolving. The atmosphere is always fairly intense, but the levels of intensity keep rising and falling, and all manner of keyboard sounds and sequenced patterns are introduced and make their statements. Radio Special Volume VIII was recorded in October 1992 and includes a lineup of Ernest Boyd on drums, L.G. Mair Jr on bass and effects, Valleri Popov on tenor saxophone, Darryll Little on alto saxophone, percussion, and effects, Kevin Mapplebeck on guitar and effects, Louis Boone on tapes, sampler, synthesizer, and effects, and Doug Walker on synthesizers, sequencers, organ, keyboards, digital horns, flute, and effects. A big band indeed! There are five tracks across this 2-CD set, 2 of them over 20 minutes. None have titles, but one standout track opens with trippy psychedelic guitars, flute, bells, Doug's space synths, and a sax that gets increasingly jazzy until finally the whole band blasts into a space jazz jam, with the guitar continuing in the psychedelic realm. It's like Ash Ra Tempel and Sun Ra on an acid jam. Totally trippy AND with a great groove. This big band Alien Planetscapes is the stuff that really gets me fired up and all spacerockers should be familiar with this music. Another highlight track features the bass laying down a groovin' line supported by the sax, cosmic flute, and steady drumming. One of the saxophones takes up the same repeating line as the bass, and with the drums make for some powerful head boppin' rhythms. High pitched keyboards, organ, and wild bubbling space synths are prominent throughout giving texture, color, and general sonic embellishment to the music. The is played at a steady pace throughout but at the end gets wildly frantic and intense, with the saxophones and organ becoming particular brain piercing and guitar licks screaming in the background. A cosmic jam of the most heavenly sort. This period in Alien Planetscapes' history is characterized by a band with its own distinct sound, but the influences manifest themselves... Soft Machine, Gong, Miles Davis, Sun Ra... but more completely in space than all of them. If you like instrumental spacerock that JAMS, then this is just the ticket. 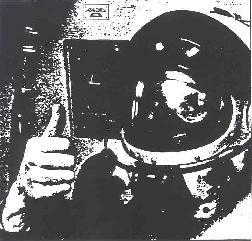 The sound quality on both CDR sets is pretty good for having originally been homemade cassette productions, the only real flaws being a few occurrences of dropout, and "Second Encounter" from Message In Space ends annoyingly abruptly. But these are only things the listener should be aware of and are in no way detrimental to fully enjoying the ride and experiencing an important piece of American spacerock and electronic music history. In fact, Doug has sent me a number of tapes over the past couple years and these are among the best sounding from the earlier Alien Planetscapes recordings I've heard. Highest recommendation! For more information on Doug Walker and Alien Planetscapes CLICK HERE to read the profile and interview we did with Doug in issue #5. You can email Doug at DWa2898572@aol.com. Contact via snail mail at Doug Walker; 191-32 116 Ave; St. Albans, NY 11412.